Relax after travel on Good Friday. Enjoy an inclusive hot drink from 7.15pm. THEN FUN & LIVELY DANCI﻿﻿NG from 7.30. [Way in is to the left.] Venue is on 11A &11C bus routes - also on 27, which passes - Bournville Rail Station. It's the first building above the Green in Linden Rd - seen here from Linden Road. Hall use permitted by: Bournville Quaker Meeting. You can always say "I or WE WILL BE COMING"
​at THIS for the NEXT DANCE to obtain a DISCOUNT of £1.50. Or go to THIS page for details to email and say ! NOZZY - are our MUSICIANS. Nicci previously played at Brummie Contras in the wonderful foursome Contra-Alt-Delete. A chance now, more prominently to hear her ace musicianship. Ozzy previously tamed this big bass beast ! But just come to see how he demonstrates his musical versatility in the duo ! 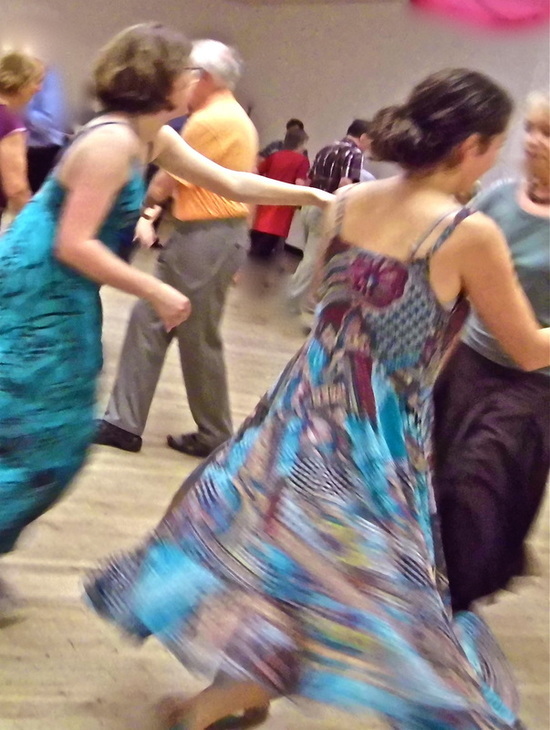 Enjoy great music for Contra dance from this brilliant youthful duo. Dances with "lift" in the American Style. Another gem pic from Mandy - some of the brilliant student dancers from Warwick Uni. C. - Title pic too: 29Nov 2015 "Brummie Contra", dancing to dynamic Double Dichotomy. You will find partners here. For everyone to improve, we usually change partners after every dance. Please regularly bring & refill a small bottle. ​Everyone really enjoys this exciting dancing to superb musicians. Some are supple; dancing youthfully. A few - still delighting in this lively dance style - do manage their moves, in spite of injury or age. Inclusive tea/coffee/squash/biscuits await traveller-arrivals at 7:15. This selection is also available in the sociable interval of 15-20mins. Chairs are also for those who wish to relax. Feel free to enjoy music, or chat, without being pulled-in to dance ! At our 1st Brummie Contra - Bob Morgan called & Recursion were our musicians. For our Anniversary, we reluctantly must again be away from our usual venue. Elmdon Heath's doctrinal limitation is because it's always left empty on Bank Holidays ! "On ﻿the door" ﻿ you used to meet Barry. I will miss Barry as a true friend. He gave great help and support to Brummie Contras. I sadly acknowledge on a page here, his death due to cardiac failure in February. (and standby alternative arrangements) have all been in place since January.